Diablo 3 will launch with 5 playable classes. As of Blizzcon 2010, all five have been revealed. The Barbarian and Witch Doctor were shown with the game reveal, in June 2008. The Wizard was revealed in October 2008 at Blizzcon. 3 New Class Has 5-character Long Name? At Blizzcon 2010, it was revealed that the fifth and final playable class in Diablo 3 is the Demon Hunter. She is mainly a ranged class with the ability to use shadow magic and traps and gadgets (like grenades! Little is known what this magic will be like, or if it will even use mana. She is a new type of character in the Diablo universe. The class's female version was the first announced, like the Wizard before her. The Demon Hunter wears black, plated armor and a hooded cloak in the debut trailer. She is a young woman around the age of 20 and has white eyes when not fighting. Near the end of the debut trailer, however, while fighting off a horde of demons, her eyes glow a fiery red. She wields two crossbows in the trailer. Like the four classes before her, she debuted with five of her skills on display. The first of these skills was the "Grenade" skill. The fifth class will be announced at BlizzCon 2010. None of the first four classes specializes in bows or ranged weapons. The Diablo 1 Warrior is too generic and his combat role is filled by the Barbarian and Monk. The Diablo 1 Sorcerer would be redundant with the Wizard. This leaves the Diablo 1 Rogue as the only realistic returning character option. Kevin Martens: It's going to fit a different niche than the existing classes, and it will still be awesome. Diii.net: Why did you choose to reveal the Monk this year? Was there some debate re: the Monk vs. the other unannounced class? Kevin Martens: It was largely chance that we developed and revealed them in the order we did. We did the Wizard last year and that was a ranged, magical class. So this year we thought the Monk, as the game’s second melee class, would be a nice change. The Monk is a good contrast from the Barbarian, our real tank class. The Barbarian can’t move as fast as the Monk, and he’s much tougher. The Monk does as much damage as the Barbarian, but he’s not as tough or durable. He has to keep moving to keep from being dominated, but if he moves right he can dominate. This was the right time to reveal the second melee class. While Kevin doesn't exactly say so, his reply contains a strong element of, "we didn't want to reveal 2 ranged attackers in a row." Since they had the unknown 5th character, and the melee fighter Monk to choose from for the 4th reveal, that strongly hints at a ranged attacker remaining for the last slot. Jay Wilson added more details about the character's long development in another Blizzcon 2009 interview. 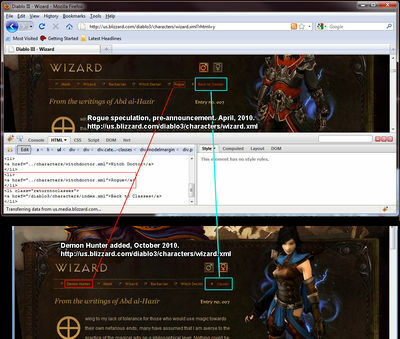 Updated screenshot comparison of the Diablo3.com character navigation. This assumption had some logic to it, but assumed that Blizzard wouldn't redesign their entire navigation bar, change the font or spacing of the other character names, etc. As we can see from the comparison shot, taken in October 2010, the "Back to Classes" link was shortened to "classes," thus freeing up enough space to fit in "Demon Hunter." Which was placed on the far left, rather than the far right, where the open space originally appeared to be. The D3 Team has confirmed that the Barbarian will be the only recurring character class from Diablo II,of the original 5 Diablo III characters. More characters will be added in expansion(s) and some may be revisions of earlier character types. We also know that the Diablo III dev team at once thought about making a Dervish class, but no information if that idea is completely shelved. It seems highly unlikely that the Dervish would appear though, as Blizzard have avoided talking about upcoming classes, and they would be unlikely to mention the class in passing if that is one class that will make the game. The Barbarian is the only Diablo II character to make it into Diablo III release. He's quite updated in style and use. The Witch Doctor is a new character, similar in use to the Necromancer. The Wizard is the third announced class, filling the archetypal magic user role previously occupied by the Sorceress. The Monk is the fourth class, and is comparable to the monk from the Hellfire expansion. The Amazon will not appear in Diablo III. The Assassin will not appear in Diablo III. The Druid will not appear in Diablo III. The Necromancer will not appear in Diablo III. The Paladin will not appear in Diablo III. The Sorceress will not appear in Diablo III. Some of these seem likely to join in on an upcoming expansion, that has been hinted about . The conceptualised Dervish class will likely not appear in Diablo III. The Barbarian is the only returning class. Originally we actually planned to have no returning classes, but as we developed the barbarian, it essentially ended up turning into a barbarian. We sort of got to the point where we went – because we actually had a different name for him originally - I think were going to call it this other name and everyone else is just going to call it the barbarian, so maybe we should just call it the barbarian. One of the things we really did not want to do – it's why we set that initial goal to not repeat classes – was, we didn't just want a rehash; we wanted to make the sequel and the sequel has new gameplay and new experiences. I know a lot of people really love the classes in Diablo 2 and it's not my desire to intentionally arc those people – I like those classes to; I love the Necromancer, he's my favorite class from Diablo 2 – but as our goal we really wanted to provide new experiences; that was our focus. Jay elaborated on the issue of returning characters in an interview with 1up.com in December 2008. Jay: I don't want to close the door on bringing back classes from Diablo or Diablo 2; I just don't want to do so with the initial release of Diablo 3. In Diablo 3, all of the classes should do something completely new. Then I'd like us to look back and figure out what gameplay gaps [exist].... Then we'd go back and satisfy our and the fans' nostalgia by pulling back some classes that we think really stood out. "Our approach for classes in 'Diablo III' is that we don't have a strong desire to bring back classes from the previous game," Wilson told me. "The goal is to try and give people new gameplay and not just re-hash old gameplay. We're not just making a 'Diablo II' with updated 3D graphics." "The problem was, we looked at the [Necromancer] class and didn't think that we could really make him a lot better," Jay explained. "We could add some new stuff to him but for the most part -- curses, corpse explosion, skeleton pets -- done. That's the class. We wanted to create new gameplay, so we chose to do the Witch Doctor as a different kind of class." See the Necromancer article for more on this issue. Fans have not just been waiting around for the next class, they have been busy making suggestions for Blizzard to consider. These fan classes include everything from a Flagellant to an Arcane Warrior. After the Wizard was revealed at Blizzcon 2008, fan speculation was widespread for what we'd seen in the remaining classes. Most fans were sure that some sort of archer/ranged attacker would be added, but it was by no means clear that character would only use ranged attacks. The character types in Diablo 3 are being designed with a lot of variety, so there was much speculation about ranged hybrid characters; possibly able to engage in melee combat, or using a variety of magical traps, stealth forms, pets, etc. The Monk was revealed at Blizzcon 2009, surprising most fans, even those who had expected some sort of light fighter to complement the heavy-tanking Barbarian. The Monk was certainly a better-kept secret than the Wizard, since before revealing the third character, Blizzard had made numerous remarks that the third character would fill a common RPG combat role, and was quite similar to a character from previous games in the series. Looking back, it's clear that Blizzard was careful not to give any meaningful hints about the Monk before the reveal. All the barbarian players are delighted and all the necromancers hate us. I understand, I don't begrudge them that. I would hate me too! But what I would say is that when we announce the next class, which is quite similar to a previous class, then all those players will hate us too. You can't make everybody happy, but I think when the game finally comes out players will find there's a good class for them, one they will love as much as the ones that came before. And if they don't, I absolutely promise that in the expansions we'll consider bringing back old classes. We just don't want to do it with the first release. We want to establish our identity. The Media Coverage has all the various interview, previews and articles about Diablo III from around the web. This page was last edited on 13 August 2011, at 03:55.